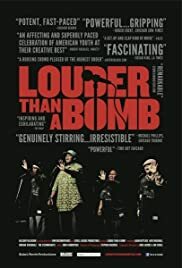 I have to admit that before seeing Greg Jacobs and Jon Siskel's documentary "Louder Than a Bomb", I had never given much thought to rap music or to poetry slams. I have dismissed rap music as a musical conduit that celebrates a culture of guns, drugs, lewdness, racism, sexism and swagger. Poetry slams, I have thought even less about. I sort of regarded as something sectioned off into the beatnik coffee houses of Greenwich Village. "Louder Than a Bomb" had me thinking deeply about the possibilities of both art forms. They can both be used as avenues to address cultural issues and break down stereotypes. If every kid thought as deeply about their lives and their environment as the kids in this movie, we'd be on our way to a better world. 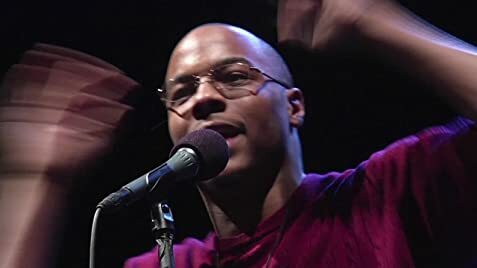 A poetry slam, in case you don't know, is a competition in which poets recite poetry as performance, in this case much like rap. A panel of up to five judges give scores based on performance and the content of the material. The scores look very much like you might see in a diving competition. Most of what the contestants convey comes from their charisma, their content and their rhythm. When a contestant is really in the zone, it is a sight to behold. The poetry takes the form of rap without music. A person takes the mike and begins a sort of verbal dance, addressing cultural and personal issues that are important to them. There is a lot of emotion in their performances and many start slow and build to a crescendo that makes your pulse race. The movie is about the 2008 high school poetry slam in Chicago called "Louder Than a Bomb". Over 50 high school from all over the Chicago area compete, and the finalists perform in an arena to an enormous crowd. The focus of the film is Steinmetz High School which won the competition in 2007 in a major upset under the direction of the tough-loving Coach Sloan who helps them work their frustration into an artistic expression. The film follows the competitors form Steinmetz and other schools as they work their hearts out trying to get a spot in the competition. Most of the kids performing are from the inner-city, from various high schools in the area. Most are black or Latino and live in rough areas and rough circumstances. The most memorable is Nova Venerable, a strong-willed young girl from Park River Forest High School who helps her mother at home with her younger brother who has a disability. Her writing is a sad allegory of her struggles at home and with her father who is not in the picture. She has the heart of a lion. Also unforgettable (and the one you'll remember) is Adam Gottlieb, a student of Northside College Prep who's round face bears a permanent grin. His spirit at the microphone is breathtaking. There's Lamar, who pours over obsessively over his notebook. In his eyes are a manner of intelligence and poise that might make him a great orator or a civic leader. Then there's my favorite Big C, tall and heavyset who wants to win and doesn't hide his tears or his big heart. "Louder Than a Bomb" was directed by Greg Jacobs and Jon Siskel. Their film had me thinking of how easy it is to turn a negative into a positive. If rap music could turn itself around and address positive issues then it might be used as an invaluable educational tool. If a movie like this could be turned into a reality show for television, I think it would be a brilliant alternative to the negative junk that is being fed to our nation's youth. Just imagine the impact it could have.